Pickersgill took up painting after the wars with France had damaged his first trade, silk manufacturing. He exhibited a portrait of Lord Hill at the Royal Academy in 1832, which may have been close to this design and gives a possible date for its execution. 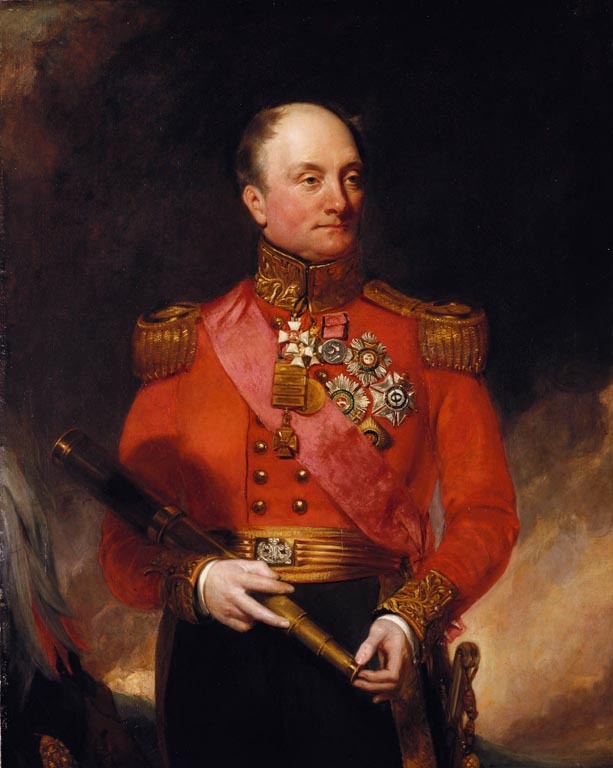 Hill was a soldier who came to Wellington's attention during the Penninsula War and distinguished himself at the Battle of Waterloo. He was a favourite of George IV and bore the Royal Standard at his coronation. He was appointed Commander-in-Chief in 1828. He is here shown in a General's uniform, holding a telescope with his plumed hat beside him. He wears the ribbon and star of the Order of the Bath, the stars of the Royal Hanoverian Guelphic Order, the Tower and Sword of Portugal and St George of Russia; he also wears the Penninsular Gold Cross, the Waterloo Medal and the badges of St George of Russia, Maria Theresa, and the Military Medal of William of the Netherlands.